When we started this comparison and review of the 2017 Hyundai Tucson Highlander and 2017 Volkswagen Tiguan 140 Highline we took into consideration that the medium SUV segment is currently one of the largest for private buyer sales in Australia. In such a competitive market the winner needed to not only have the best safety features and fuel economy for the pragmatics out there but also driver connectivity that kept the occupants bonded with their technology and also offered every day practicality. On this occasion the nod goes to the 2017 Volkswagen Tiguan 140 Highline. On face value it appears to be very much the same vehicle that Hyundai has offered in the Tucson Highlander but when you got up close and personal the driver infotainment, interior finished and driving package bring it out on top. The added benefit of the optional R Line package make the Tiguan a more flexible approach to the SUV landscape. For those who need the extra 900KG’s of towing capability in the Tiguan the decision is quite easy. But, the Tucson is offered with a standard 5 year warranty versus the Tiguan’s 3 year unlimited kilometers and 10 years road side assist. • With the help of former Volkswagen Automotive Group chief automobile designer, Peter Schreyer, Hyundai have taken notice of the buying public and have gone with a level of boldness previously lacking in the medium SUV segment. • The rest of the body flows well from front to back, helped by Shreyer’s trademark use of flowing lines and angles. • The Highlander is the only variant offering the dual chrome exhaust tips along with the front and rear matte grey effect skid plates. Also bespoke to the Highlander are the side repeaters on the side mirrors and rear LED lights. • The Tucson is very easy on the eye and has attracted the attention of both male and female buyers very successfully. Is it demographic proof? We think so. • When the Tucson first landed in Australia it did so with a 4 star ANCAP safety rating which was disappointing. The main concern being occupant zone intrusion under major accident conditions. 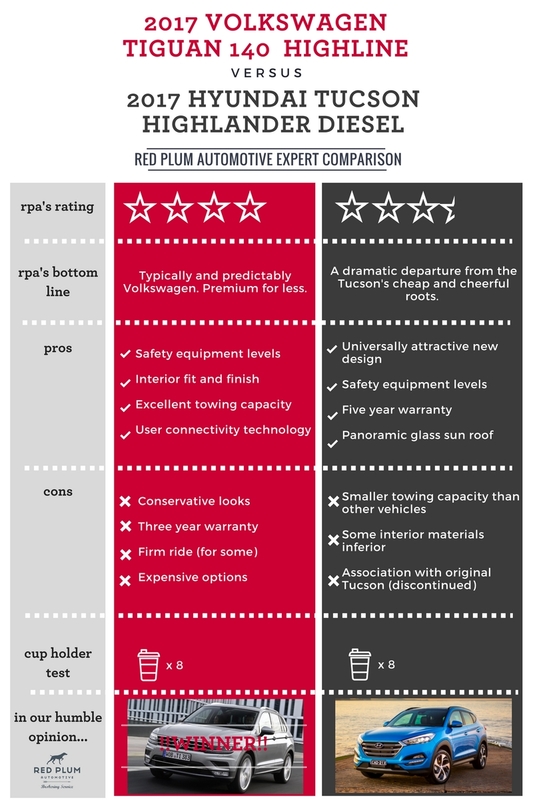 This has since been rectified and the Tucson now has the full 5 stars. • Until the Tucson there was little pressure for manufacturers to offer their customers the full list of active and passive safety options at this price point. • The Highlander has every safety feature you could need from lane departure and blind spot warnings to more intrusive features such as the forward collision warning and lane keeping assist. • We think the trailer stability assist is a nice touch for those intending on towing. The Hyundai Tucson Highlander doesn’t quite have the lashings of expensive trimmings and soft touch plastics that you typically find with manufacturers like Mercedes Benz and Audi but at near enough as makes no difference to half the price for the same amount of room and standard inclusions it can be forgiven. The problem for the Tucson is that we are comparing it with the Tiguan and the Tiguan simply does it better. However the Tucson highlander is fitted with heating and cooling 8 way electric leather appointed seats which is always nice any time of the year. • Between the 2,670MM wheelbase fits 5 grown up occupants. Add two child seats and that 5 quickly becomes 4.5. A typical scenario in this size car though. • The Highlander along with the Elite variants come with dual zone climate control and importantly also come standard with rear center console air vents for the kids or back seat passengers. • For the stargazers and those who like the wind in their hair the panoramic glass sunroof will delight. • If we were to hand pick the features that stood out most for the Tucson highlander we would certainly list the highly intuitive 8” colour navigation and infotainment system, the smart electric tailgate with hands free opening and the interior LED lighting that perfectly caps off a classy interior especially when ordered in a lighter colour. • As it appears caravanning is a growing past time we thought we would also make mention again of the trailer stability system which electronically senses the weight shifting behind the vehicle and adjusts the stability program to combat the sudden weight shift and correct the trailers tracking. • The new VW Tiguan has had the luxury of being able to draw on the successful model that came before it. VW have a knack of future proofing their designs and the new Tiguan has benefited greatly because of it. • Volkswagen have kept the elegant lines that helped make the Tiguan a success but have done a great job in keeping with the growing trend of bold front grilles, LED lights and a commanding stance even when standing still. • Unlike the Tucson, the Tiguan has opted for a wide but narrow front grille giving an exaggerated impression of width. VW have also cleverly placed the LED day time running lights on the very corners of the front bumper for, again, the impression of width. A common thread with European cars. • The Tiguan, like the Tucson, flows neatly from front to back through the aid of sharp hip lines and flowing sheet metal. The 140 Highline gets the 18” Kingston wheel as standard. 1” smaller than the wheels on the Tucson Highlander, though the Tiguan can be optioned with the sporty R Line package giving it 20” wheels, larger front air dams and body mouldings, bespoke R Line seats and also steering wheel which will no doubt be popular. • The Tucson and Tiguan share very much the same airbag configuration along with camera options and parking sensors so no clear winner there. What the Tiguan does have, however, is front assist with city emergency braking. This incorporates its radar system to avoid or mitigate front on accidents. A big tick there from us considering this technology has only just being rolled out by the majority of Luxury brands. • What the Tiguan does have, however, is front assist with city emergency braking. This incorporates its radar system to avoid or mitigate front on accidents. A big tick there from us considering this technology has only just being rolled out by the majority of Luxury brands. • The Tiguan also comes with an enormous 12.3” display behind the steering wheel allowing the driver to configure it for navigation, driver assistance, off road and driver performance systems. While numbers here give the performance edge ever so slightly to the Tiguan it is the towing capacity that puts the Tiguan in the clear, coming in at 2,500KG braked it clearly outclasses the Tucson’s 1,600KG. How much of factor will that play in the purchasing decision? Not a lot unless you are buying the car for one of its most intended purposes. Towing. • In very typical VW fashion, inside the Tiguan is a very nice place to spend time. Soft touch surfaces and black Vienna leather are abundant. The high quality decorative inserts are a nice touch too. • The seats in the Tiguan Highline are bolstered more towards driver comfort than sporty but we will again mention the option for the R Line Package – should you want a sportier more figure hugging seat. • The suspension in the Tiguan is more on the firm side than the Tucson. A test drive and your personal preference will play a big part on your decision here. • To not make mention of the Tiguan’s extensive use of cameras would be a grave injustice to its overall functionality. There is the standard reverse camera but also cameras that let you see around your car in 360 degrees while parking giving the driver the view as if being filmed from above by a helicopter. VW call this Are View. We call it amazing.